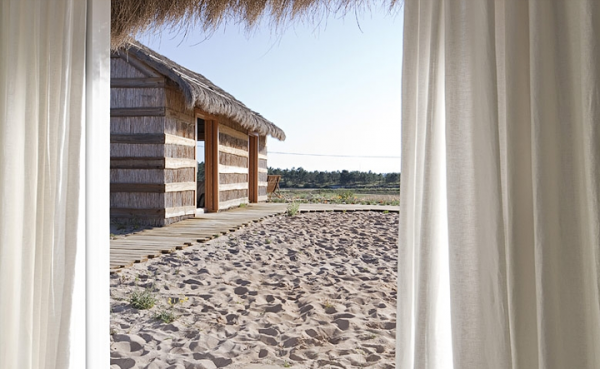 These outstanding beach cottages are located in Portugal, near Lisbon, and they are called Casas Na Areia. This is probably the most peaceful scene we have ever laid our eyes on. 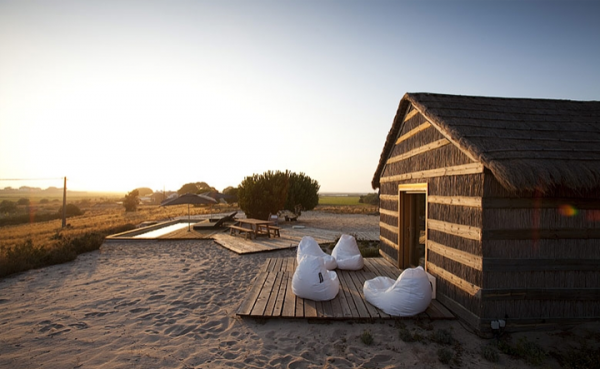 We love the rustic atmosphere, natural wood, and the surrounding sand. The white bean bags are fantastic touches. They contribute to the relaxing nature of the cottage and they complement the wood perfectly. The beach cottages are surrounded by a beautiful landscape. Inside the living room, glass doors provide easy outdoor access and natural light. 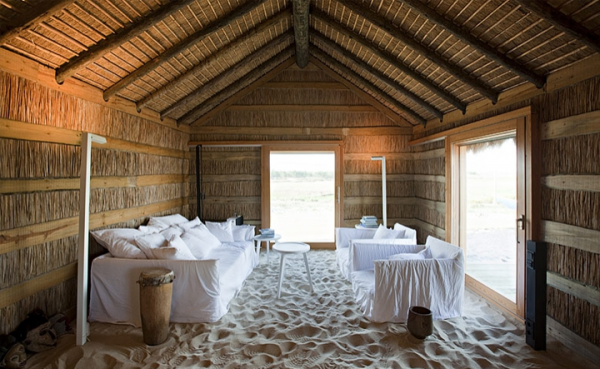 The floors are sand, connecting to the outdoors, and promoting a carefree beach mindset within the home. A lengthy white sofa, two white chairs, and white tables fill the space, keeping with the laid back ambience. The dining area is simple but striking. The relationship between the white and brown color palette is even more sumptuous in this space. A long brown wooden table is surrounded by magnificent white chairs. Framing the space, two white ceiling lights, complete the exquisite design. The sand continues in this area, and a sleek white kitchen sits towards the back. In the bathroom, the floors are gray, adding a wonderful cool tone to the design. 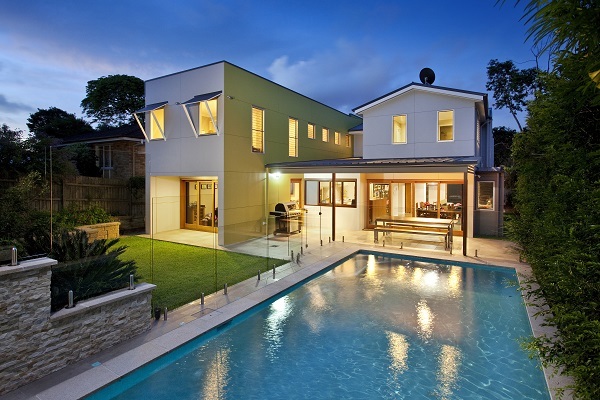 A fantastic door provides outdoor access, and long white curtains, allow for a bit of privacy. We love the simplicity of this room, it is remarkably elegant. 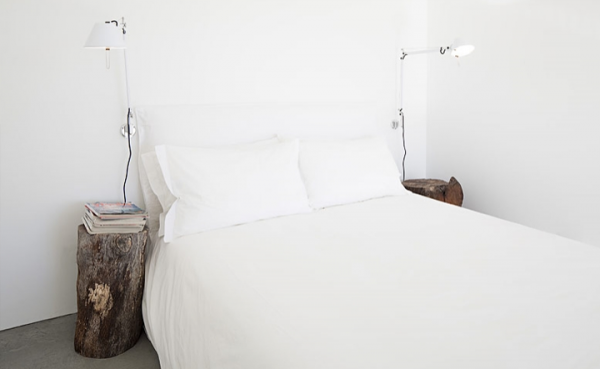 The bedroom consists of a white comfy bed, two lights, and marvelous logs used as bedside tables. The logs continue the connection to nature used throughout the cottage. These beach cottages have an amazing pool area. 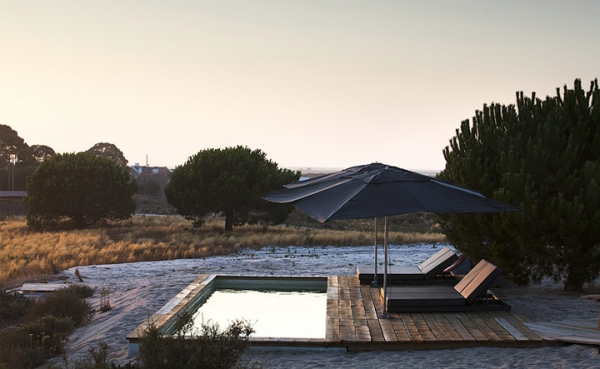 Loungers and umbrellas fashion the perfect place to sunbathe and relax. 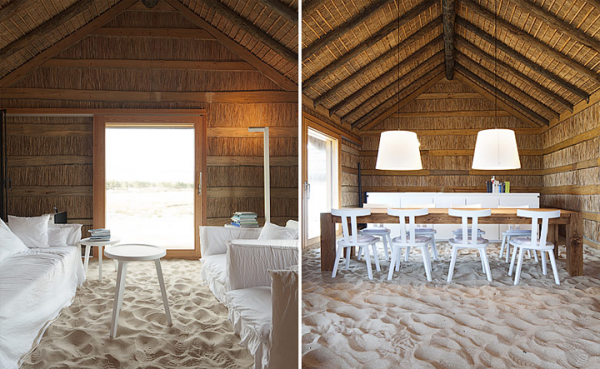 We are a little bit in love with Casas Na Areia. 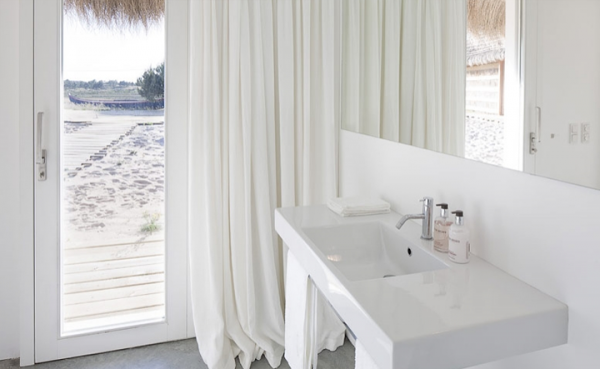 It is definitely a unique space with its sand floors and awe-inspiring scenery, but what makes it even more special is its elegant simplicity.